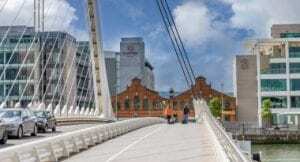 Dublin’s shopping, sightseeing and business districts are a stone’s throw from Clayton Hotel Cardiff Lane. The seven-story Dublin city centre hotel boasts views of the River Liffey while remaining close to the heart of the city. Clayton Hotel Cardiff Lane is within easy access of the airport and main bus & rail stations and a few minutes’ walk from the Spencer Dock Luas stop, over the Samuel Beckett Bridge. Taxis are available from outside both arrival halls, although may be limited during peak travel times. Journey time is approx. 25 – 30 minutes and you can expect to pay between €30.00 – €35.00. Aircoach Route 702 from Dublin Airport Terminals 1 & 2 stops just outside Clayton Hotel Cardiff Lane. Fares are from €10.00 return or €6.00 single for an adult, journey time is approximately 40 minutes. Both Airlink 747 and 757 services stop outside the Convention Centre Dublin, a 5-minute walk from Clayton Hotel Cardiff Lane across the Samuel Beckett Bridge. Buses depart every 10-20 minutes, journeys cost €10.00 return or €6.00 one way and take approximately 25 minutes. There is no car park at Clayton Hotel Cardiff Lane however, there is a public car park located in Grand Canal Square, just across the street from the hotel. It is possible to pre-book your parking space online at a 24-hour rate of €24.00 in Q-Park Grand Canal by clicking here. Clayton Hotel Cardiff Lane is only 5 minutes’ walk from the Spencer Dock Stop on the Luas red line. Trams depart every 10 minutes during peak times.